Designed especially for pre-schoolers, our workshops are an opportunity to develop fine and gross motor skills while investigating, hypothesising and experimenting with materials. Current workshop themes for toddlers and pre-schoolers are Noisemakers, Under The Sea and Float Your Boat and Ocean Loose Parts Play. Pick one workshop or combine them using our Exploring the sea format. Customised workshops are also available. We guarantee a playful and inclusive experience with warm and engaging educators that encourage the under-5s to feel like they belong to a curious, creative and co-operative community with a practical sense of respect and responsibility for the environment. Reverse Garbage Early Learning workshops align with the Early Years Learning Framework for Australia. Turn junk into noisemakers and make yourself heard! Children are given the opportunity to investigate all sorts of reuse materials and test them to make interesting sounds. Children will develop an understanding of sound generation and basic construction skills while they make a shaker that rattles and rolls wherever it goes. Sort a selection of clean waste materials into their correct bins. Find out how to tell the difference between the types of plastics (hard, bendy or soft) and how they can be recycled. Travel into the depths of the ocean to transform trash into own sea creatures and treasures. Children can make a clown fish, a sea-junk necklace or a jellyfish puppet. Note this is a tape-and-glue-free workshop that reinforces tying, threading and lacing skills. Ask us about a discount for a second group on the same day! Sort a selection of clean waste materials into their correct bins. Find out how to tell the difference between different types of plastics (hard, bendy or soft) and how they can be recycled. Then make boats from plastic containers and other materials and test how well they float. We will bring (and leave) a sack full of ocean-themed loose parts play material to engage your 0-3 year olds. 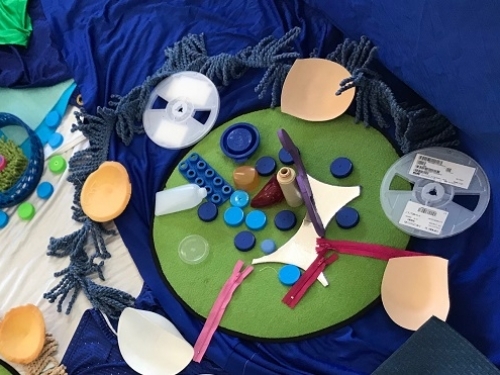 Carefully arranged to mimic a beach scene and ocean creatures, the textures and shapes of the unique materials invite sensory exploration and role play.